The Alexander Murray Log and Sketch Book is a collection of drawings and diary entries made by a naval officer shortly after the Civil War. Alexander Murray was born in 1816 in Philadelphia, Penn., and died in 1884 in Washington, D.C. The son of Alexander Murray, Sr. also of the American navy, the younger Murray served as lieutenant from 1847-1862, commander froim 1862-1866, captain from 1866-1871, and commodore from 1871- 1876. He was a verteran of the Mexican-American War and the American Civil War, participating in several significant military operations including the battle of Roanoke Island. 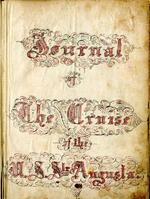 From 1866-67, roughly the time period this log was written, Murray was on special service aboard the U.S.S. Augusta on a tour of duty overseas. Murray later served as a lighthouse inspector and retired from the Navy in 1876. Source: Appletons' Cyclopaedia of American Biography, Vol. IV Lodge-Pickens, edited by James Grant Wilson and John Fiske (New York: D. Appleton and Co., 1888), p. 567; made available by the University of Michigan and the Hathi Trust. Information on the item and digitization by Jacob Crescent.